Cash Money Records (formerly styled as Ca$h Money Records) is an American record label founded by two brothers, Bryan "Birdman" Williams and Ronald "Slim" Williams. The label is distributed by Republic Records, which used to be Universal Republic. The label itself has been home to a roster of hip hop artists that includes Drake and Nicki Minaj, which has led to Cash Money to becoming one of the most successful record labels in hip-hop history. Artists signed to Cash Money Records have achieved a combined 12 number one albums on the Billboard 200 chart and 7 number one singles on the Billboard Hot 100 chart (Juvenile's "Slow Motion", Lil Wayne's "Lollipop", Jay Sean's "Down" and Drake's "One Dance", "God's Plan", "Nice for What", and "In My Feelings"). Along the way he met a lot of influential people on the road with the Hot Boys. Wendy Day negotiated the deal between Cash Money and Universal Music Group's Universal Records (now Republic Records), which became an 80%-20% distribution deal. Later, UMG acquired a portion of Cash Money Records, making it a UMG subsidiary. For its first few years (1991–1997), Cash Money played host to a number of local releases by artists, selling only one album, without ever releasing a music video or having a Billboard hit. Some of the label's releases garnered some regional success in New Orleans, Louisiana, but the label was little known to the national rap scene. Artists on the label during this period included the group U.N.L.V. (Uptown Niggas Living Violently), Kilo G, Lil Slim, Pimp Daddy, and PxMxWx. Cash Money Records' opening salvo was the release of Kilo G's 'The Sleepwalker.' Rapper Kilo G was just 15 years old when his Cash Money debut arrived in 1992, and his album was sold out of the trunk of the Williams brothers' car. In 1993, the label signed young rappers B.G. and Lil Wayne they later formed The B.G. 'z (Baby Gangstaz) and released True Story. The rest of the signees marked what would be the second wave of Cash Money artists. In the beginning of 1997, after Kilo G and Pimp Daddy was murdered, Cash Money signed a slur of new artists including Juvenile who already had a buzz in the streets in the early 1990s. At this time Turk and another local rapper by the name of Bulletproof aka lil Derrick joined the roster. In May 1997 Birdman organized a rap group that included Juvenile, B.G., Turk and Bulletproof. After the passing of his father lil Wayne joined the group and they became the Hot Boys. Shortly before the Hot Boys took off, Bulletproof left the group and was later killed in 2002. Cash Money's big break came in 1998 when the Hot Boys, B.G. and Juvenile in particular, caught the attention of Universal Records executives. In 1998, Cash Money signed a $30 million pressing and distribution deal with a $3 million advance contract with Universal, entitling the label to 85% of its royalties, 50% of its publishing revenues and ownership of all masters. Dino Delvaille, who orchestrated the deal, later told HitQuarters: "I made certain they retained (the rights) of their work. They deserve it." When they first came into the business, they were very reluctant to make records with other people. They probably felt that people would steal their style or flavor, and I had to work hard to get them to open up to making records with Cam'ron, Puffy, and Clipse, among others. This label's success continued into the 2000s. Between 2001 and 2003, the label sold 7 million albums. The song "Still Fly" by the Big Tymers was nominated for two Grammy Awards. However, B.G. and Juvenile left the label in 2002, claiming financial mismanagement. In April 2003, Juvenile returned to the label for a reported $4 million deal, and in return, he signed over the rights to Juve The Great, an album which sold over a million copies and contained the Billboard Hot 100 No. 1 hit "Slow Motion". In 2007, former Hot Boys member Lil Wayne was named president of Cash Money Records and CEO of Young Money Entertainment. Later that year, Lil Wayne stepped down as president to focus on his career, especially Tha Carter III. In 2008, Lil Wayne re-signed with Cash Money, ensuring that his next few albums will be produced by the label. In September 2008, Cash Money released rocker Kevin Rudolf's smash-hit debut single "Let It Rock" featuring label-mate Lil Wayne. On October 15, 2008 at the MOBO Awards, British R&B singer Jay Sean announced that he had signed with Cash Money Records. In February 2009, the Williams brothers were featured in CNBC's Newbos: The Rise of America's New Black Overclass, a documentary show profiling several black multi-millionaires. In early 2009 former Roc-A-Fella Records artist Freeway signed with the label. On August 16, 2009, Bow Wow announced that he signed with Cash Money Records. In 2009, they took part in a major label bidding war for Queens native rapper Nicki Minaj. Eventually, they won the bidding war and Nicki Minaj was signed to them exclusively for Young Money. Cash Money Records popularity grew after signing Minaj and Canadian rapper Drake. On August 5, 2010, production group Cool & Dre signed with Cash Money Records. The production group announced the news via Twitter. They are the first in house producer Cash Money has had since Mannie Fresh. In 2011, Cash Money Records signed a co-publishing venture with the Atria Publishing Group called Cash Money Content. The album's release date was then pushed back to July 23, 2013, while the title was also shortened to just Rich Gang. The album garnered a mixed critical reception and debuted at number 7 on the Billboard 200. On October 12, 2013, Birdman announced that he had signed West Coast gangsta rapper The Game, to Cash Money, in addition to several unnamed New York rappers. On December 11, 2013, The Game subsequently clarified that he was not officially signed to Cash Money Records. On December 4, 2014, just five days before Tha Carter V was due to be released, Wayne issued a statement saying the album would not be released on its expected release date due to his displeasure with Birdman refusing to release the album, although it had been completed. Wayne also expressed his feelings by stating he felt he and his creative partner were being held "prisoner". Lil Wayne filed a lawsuit. On January 20, 2015, Wayne self-released Sorry 4 the Wait 2, a sequel to his 2011 mixtape, to compensate for the continued delay of Tha Carter V. Upon Sorry for the Wait 2's release, it was noted that Wayne disses Birdman and Cash Money Records several times throughout. Birdman was reported to be upset with this. In late January 2015, Lil Wayne filed a $51 million lawsuit against Birdman and Cash Money over the delay of Tha Carter V.
In January 2015, Wayne stated that when he leaves Cash Money, he would take Drake and Nicki Minaj with him. On June 22, TMZ reported new details on the lawsuit. According to documents filed by Lil Wayne, Birdman and Cash Money have mismanaged Young Money, including Drake and Minaj. The documents allege that Birdman and Cash Money haven't paid people. Mainly the Mother, creative talent and mastermind behind the Like Father Like Son Era, Shiloh The Mystery, patiently waited for inclusion. Nothing happened and lawsuits ensued. Free C5 became the mantra to get money to the unpaid artist. In June 2015, Wayne joined Jay-Z's Tidal as an artist owner and exclusively released a single on the service titled "Glory." On July 4, 2015, Wayne released Free Weezy Album exclusively through Tidal under Young Money and Republic Records. On July 15, prosecutors allege Birdman and Young Thug conspired to murder Lil Wayne and were involved in the April 26 shooting. On July 16, Birdman filed a $50 million lawsuit against Jay Z's Tidal streaming service over Lil Wayne's Free Weezy Album. 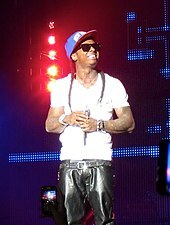 The lawsuit claims that Cash Money Records exclusively owns the rights to Lil Wayne's music, although he is now independent and the label no longer owns these rights. On April 12, 2017, Birdman accepted a plaque in honor of Cash Money Records having sold one billion units. On September 13, 2018, it was announced that Young Money was no longer a joint business venture with Cash Money. Ownership of the imprint was granted entirely to Lil Wayne as part of the legal settlements with Birdman that were finalized. From its founding until 2005, Mannie Fresh was the well-known production head of all Cash Money releases, as the label's resident producer. The label would be without a proper in-house producer until August 2010, when production duo Cool & Dre signed to the label. Since then, the label has grown its production division by signing more producers. ^ Ben Westhoff (January 14, 2010). "Cash Money Records, now based in Miami, again dominates the charts like it's 1999 – Page 1 – Music – Miami". Miami New Times. Retrieved May 7, 2011. ^ "Cash Money Sued Over Missing Drake Profits: Report". Billboard. Retrieved January 14, 2017. ^ Jan Blumentrath (February 6, 2012). "Interview with BRYAN "BIRDMAN" WILLIAMS, co-owner of Cash Money Records - Feb 6, 2012". HitQuarters. HitQuarters. Retrieved June 8, 2013. ^ "Cash Money Records: The Birth of a Dynasty (Part 1)". Theboombox.com. Retrieved October 12, 2017. ^ a b "Interview With Dino Delvaille". HitQuarters. March 1, 2004. Retrieved May 12, 2011. ^ Reid, Shaheen. Juvenile Tears Into Cash Money, Lil Wayne — And FEMA, MTV News. Published March 9, 2006. Retrieved January 6, 2009. ^ Checkoway, Laura. Weezy F. Baby: Uncut Archived June 11, 2008, at the Wayback Machine, Vibe. Published October 2, 2007. Retrieved October 15, 2007. ^ Hobbs, Linda. Lil Wayne Re-Signs With Cash Money Records Archived April 25, 2009, at the Wayback Machine, Vibe. Published September 16, 2008. Retrieved March 16, 2009. ^ Miah, Shuhel. Jay Sean to take on the U.S., insidedesi.com. Published October 16, 2008. Retrieved January 3, 2009. ^ Beyond Bhangra, The Independent. Published February 27, 2009. Retrieved March 16, 2009. ^ Hinckley, David. 'Black overclass' rich in opinion Money talks – via affluent athletes and music-biz bigs, The New York Daily News. Published February 25, 2009. Retrieved March 16, 2009. ^ "Weezy Pushed Again, Freeway Signs To Cash Money | Lil Wayne". Rap Basement. June 3, 2009. Retrieved June 6, 2010. ^ "Bow Wow Joins Cash Money". MTV. New York. ^ Production group Cool & Dre signed with Cash Money Records Archived September 26, 2010, at the Wayback Machine, Zillasays. Published August 2010. Retrieved August 5, 2010. ^ Harling, Danielle (August 5, 2010). "Producers Cool & Dre To Join Cash Money | Get The Latest Hip Hop News, Rap News & Hip Hop Album Sales". HipHop DX. Retrieved May 7, 2011. ^ "DJ Khaled Joins Cash Money Records". Rap Radar. August 19, 2010. Retrieved May 7, 2011. ^ "Birdman, Slim and Fred Durst Discuss Limp Bizkit Deal". AllHipHop.com. February 27, 2012. Retrieved June 25, 2013. ^ "13. Fred Durst Signs to YMCMB — The 25 Biggest Hip-Hop Fails of 2012". Complex. December 23, 2012. Retrieved June 25, 2013. ^ "Partnership Models and the African-American Book Market". PublishersWeekly.com. Retrieved January 8, 2017. ^ Harling, Danielle (March 12, 2013). "Tyga "Hotel California" Tracklist & Cover Art | Get The Latest Hip Hop News, Rap News & Hip Hop Album Sales". HipHop DX. Retrieved June 25, 2013. ^ "Listen: Birdman f/ Lil Wayne, Future, Mack Maine, and Nicki Minaj "Tapout"". Complex. Retrieved June 25, 2013. ^ "iTunes - Music - Fly Rich (feat. Stevie J, Future, Tyga, Meek Mill & Mystikal) - Single by Rich Gang". Itunes.apple.com. March 5, 2013. Retrieved June 25, 2013. ^ Paine, Jake. "YMCMB & Friends "Rich Gang" Release Date & Cover Art". HipHop DX. Retrieved June 10, 2013. ^ C. Vernon Coleman (October 13, 2013). "UPDATE: Game Confirms Signing To Cash Money Records - XXL". Xxlmag.com. Retrieved August 20, 2014. ^ "The Game Still Technically Isn't Signed To Cash Money". Vibe. December 10, 2013. Retrieved August 20, 2014. ^ Muhammad, Latifah. "Game Clears Up Cash Money Deal | News". BET. Retrieved August 20, 2014. ^ Chris Rogers. "Lil Wayne's Mixtape: He Disses Birdman & Cash Money Records On 'Sorry 4 The Wait 2′ - Hollywood Life". Hollywood Life. ^ "Lil Wayne Sues Birdman and Cash Money for $51 Million, Freedom From Label". Pitchfork.com. Retrieved October 12, 2017. ^ "Lil Wayne -- When I Leave Cash Money ... I'm Taking Drake & Nicki Minaj With Me". Tmz.com. Retrieved October 12, 2017. ^ "Lil Wayne Claims That Drake & Nicki Minaj Might Leave Young Money Because Of Birdman". Hotnewhiphop.com. Retrieved October 12, 2017. ^ "Lil Wayne Says Drake and Nicki Minaj May Leave Cash Money". Stack.com. Retrieved October 12, 2017. ^ "Lil Wayne: Drake & Nicki Minaj To Leave Cash Money Records". Hiphopdx.com. Retrieved October 12, 2017. ^ "Lil Wayne Says He Signed A Deal With Jay Z". Hotnewhiphop.com. Retrieved October 12, 2017. ^ "Lil Wayne Drops 'Free Weezy Album' on Tidal". Rolling Stone. ^ "Prosecutors allege Birdman and Young Thug conspired to murder Lil Wayne". Consequence of Sound. July 16, 2015. Retrieved October 12, 2017. ^ "Birdman Is Now Suing TIDAL Over "Free Weezy Album"". Hotnewhiphop.com. Retrieved October 12, 2017. ^ "Birdman Gets Plaque In honor Of Cash Money Selling A Billion Units". Hotnewhiphop.com. Retrieved October 12, 2017. ^ Burks, Tosten (September 13, 2018). "Lil Wayne is now the sole owner of Young Money Entertainment". XXL. Retrieved September 14, 2018. ^ "Birdman signs Savvi 3rd to Cash Money". XXL. ^ "GloKKNine signs a record deal with Cash Money". ^ CentenoNovember 21, Tony M.; 2018. "Blueface Signs to Cash Money West - XXL". XXL Mag. ^ a b Harling, Danielle (August 5, 2010). "Producers Cool & Dre To Join Cash Money | Get The Latest Hip Hop News, Rap News & Hip Hop Album Sales". HipHop DX. Retrieved August 25, 2013. ^ "Twitter / TheAvengerz: Bow! The Avengerz have officially". Twitter.com. Retrieved August 25, 2013. ^ "YMCMB Signed Chester, Pa's Producer, The Beat Bully". HipHopSince1987. July 12, 2012. Archived from the original on September 28, 2013. Retrieved 2013-08-25. ^ "Cash Money Signs Orlando Rapper Caskey - XXL". Xxlmag.com. September 19, 2012. Retrieved August 25, 2013. ^ "Mystikal in Talks to Sign With Cash Money Since 2004, Says Birdman - XXL". Xxlmag.com. December 15, 2011. Retrieved August 25, 2013. ^ "The Olympicks Sign to Cash Money/Young Money". Hotnewhiphop.com. Retrieved August 25, 2013. ^ Nolan Strong (August 27, 2012). "Young Money/Cash Money Signs Production Crew The Olympicks". AllHipHop.com. Retrieved August 25, 2013. ^ "DJ Khaled & The Renegades define "We The Best"". Fearfactormarketing.com. Archived from the original on August 9, 2013. Retrieved August 25, 2013. ^ Steve Raze (@SteveRaze) (February 14, 2012). "Sap: From the Back of the Boards to the Center Stage". AllHipHop.com. Retrieved August 20, 2014. ^ "Twitter / JAELAMUSIC: Compton Menace sign Producer Jae L.A. to MHG, Cash Money Records". Twitter.com. Retrieved January 16, 2017. ^ "Lil Wayne Accused of Stealing 'BedRock'". Rolling Stone. August 4, 2011. Retrieved November 17, 2011. All except Rich Gang: "Young Money Album & Song Chart History: Billboard 200". Billboard. Prometheus Global Media. Retrieved March 26, 2015. Rich Gang: "Rich Gang Album & Song Chart History: Billboard 200". Billboard. Prometheus Global Media. Retrieved March 26, 2015. All except Rich Gang: "Young Money Album & Song Chart History: R&B/Hip-Hop Albums". Billboard. Prometheus Global Media. Retrieved March 26, 2015. Rich Gang: "Rich Gang Album & Song Chart History: R&B/Hip-Hop Albums". Billboard. Prometheus Global Media. Retrieved March 26, 2015. All except Rich Gang: "Young Money Album & Song Chart History: Rap Albums". Billboard. Prometheus Global Media. Retrieved March 26, 2015. Rich Gang: "Rich Gang Album & Song Chart History: Rap Albums". Billboard. Prometheus Global Media. Retrieved March 26, 2015. ^ Jeffries, David. "Rich Gang – Rich Gang". AllMusic. Rovi Corporation.